Reigning from the untouched city of producers, Seattle, DVRE has developed a unique sound through bass heavy oriented music. His live performances are very heavy and consist of crazy, unanticipated doubles and triples. 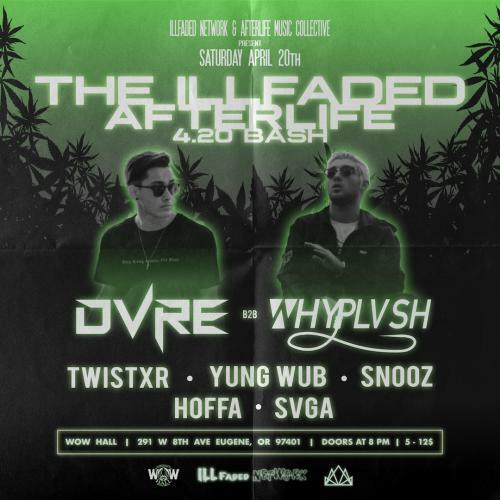 After sharing the stage with artists such as Ponicz, Slimez, Martz, Rekoils and Dion Timmer within a short span of a year, DVRE has quickly gained traction in a high demand industry. Whyplvsh is a 21 year old producer based out of Los Angeles. This is his first time returning to Eugene to play a show after leaving the University of Oregon. After spending a year working on music he is finally ready for 2019 to be the year he starts turning heads and showing what he can do. If you like a combination of melodic music with soul crushing bass this is def an artist for you. Plus SNOOZ, HOFFA and SVGA. Get your tickets early as the price increases as the tickets are sold: $5 Early Bird 1, $8 Early Bird 2, then $10 advance; $13 at the door. Doors open at 7:30 pm and showtime is 8:00.